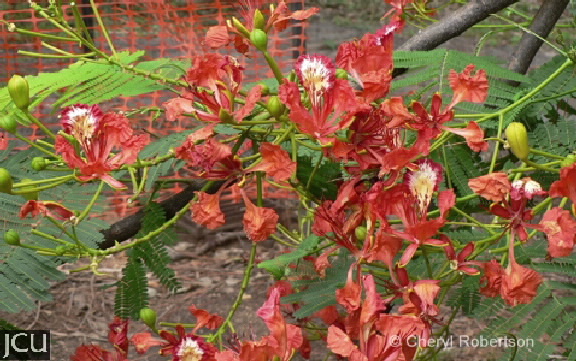 Originally from Madagascar, this large, spreading tree bears numerous bunches of orange-red flowers in November and December, these are followed by large flat pods which remain on the tree for most of the year. 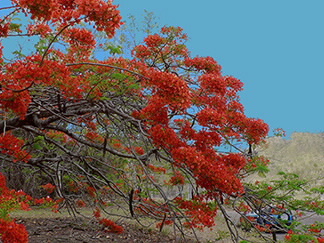 In the latter half of the dry season the tree is deciduous or semi-deciduous, with new leaves usually appearing as flowering is nearly finished. There are a number of colour forms around. The heartwood is susceptible to termites and to the fungus Ganoderma.